If you look at the art world in general it is very rare for a woman to “make it” and to get the recognition her art deserves. In Latin American Art I can only really name Frida Kahlo, Leonora Carrington and Remedios Varo as being well known. Of course there are many more, but I do not believe they have received the same interest from the more general media as those mentioned. And, for the moment, the same is true of the relationship the media has with the work of Debora Arango. Strangely, as for most artists, much of the recognition start to come with their death! Debora Arango died at the age of 98 in 2005 and was one of Colombia´s female pioneers in the always male dominated world of art. In general I believe that the media in Colombia have been very generous in their recognition of her contribution to the arts and have given her work continual support even after her death in 2005. Indeed, right now her work is being exhibited in the Cabañas Cultural Institute in Guadalajara in Mexico. Why wasn´t an exhibition organized10 or 15 years ago? Well, it seems like in art you have to die before you “make it”! 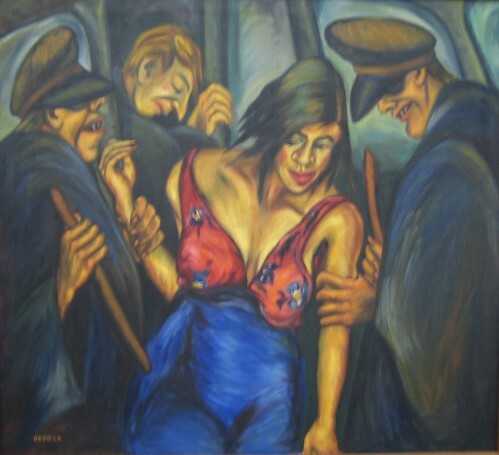 So, why is the art of Debora Arango slowly gaining more recognition.Well, (and now here comes the sexist comment and truth) – part of this recognition by the press is directly attributable to the fact that she was a woman who was at the time (1940s) dealing with nudes as well as politics in her art. Both controversial topics for that period and more particularly for a woman to be “discussing” them. Is this wrong? Is it wrong for the press to have given Debora Arango so much news-space due to the fact that she was a woman who happened to wish to touch on these subjects. Most definitely not, in my opinion, especially when you look at the history of the development of art and the arts in a country like Colombia. Debora Arango was a ground breaker for women in the arts. She was the Frida Kahlo of Colombia. In any case, I am not sure that had a male artist touched on these themes that there would have been the same outcry but also I do not believe that a male artist could have represented the themes in the way that Debora did. As such – she was simply unique. Technically, I do not see that art created by Debora was at all exceptional. At least I have not seen anything in her work that would lead me to believe so. However, she did have a very well defined style, which is also important in art, that definitely help distinguish her work from other artists. And, she also had the ability to choose some exceptional themes to work with and it is that selection of themes that have allowed her work through a historical perspective to position the artist where she is today. 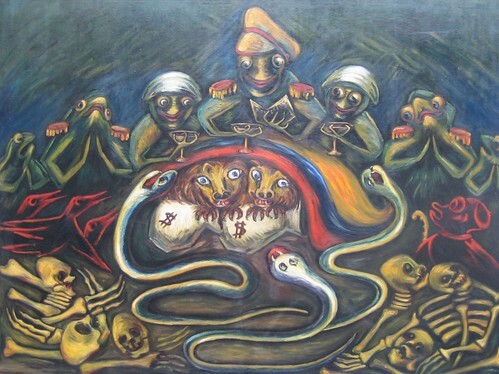 Few artists in the 1940´s, in Colombia at least, were presenting political and social criticism through their art to the extent that Deborah did. Not only did she comment upon the political and social situations, but also lead the way in presenting the plight of the ordinary woman in the Colombian society of that day. 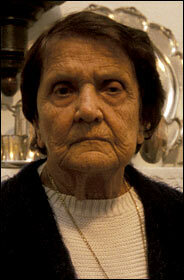 I only ever met Debora Arango once, at her home in Medellín in November 2002. She would have been around 94 then. Accompanied by her younger sister we had a short talk and then she allowed me to view her beautiful home, still filled with her original artworks and ceramics, and her workshop which, as she admitted, hadn´t been in use for at least a couple of years since she had experienced difficulty with arthritis in her hand during those years. We talked about the work she created during her “political” years, in the 1940s but she was most proud of a more recent work she had created of one of Colombia´s presidents, Belisario Betancourt, who had been very supportive of the arts and culture during his term in office. Debora came across as a very serious if not somber person and this was largely reflected in her art . . . I do not remember seeing any work that could be described as frivolous and so I am sure she understood the power of the medium she used as a form of communication rather than as simple fine art. Perhaps this is because of the time she spent on Mexico working alongside the like of Diego River, David Siquieros and other Mexican muralists. When she got back to Colombia however she only ever made one mural, in Medellín. Given that Debora´s work is not really known at all internationally it comes as no surprise that there is no record (at least none that I have found) of her work being sold in auction or galleries. However, that said, given that her donation of work to the Museum of Antioquia was so large there are very few good pieces available on the market. As such the tendency of the prices for those artworks that are available and that are of reasonable quality and interest is to force up the prices. Having said that I do believe that it will take a while for the market to absorb this work locally given that the Colombian art market, though quite vibrant, is still very small. For example a small (30cm x 40cm) watercolor work on paper will value between COP $12.000 – 25.000.000 (USD $6,000 – 12,000) in gallery. For that type of cash, if you are looking to invest, you can acquire a lot of works from artists that may better appreciate in the short to medium term. However, as always in art, if you want your Debora Arango artwork you will have to pay pretty much the price being asked. i would like to know the name of the paintings up there. He estado investigando a Debora Arango para una presentacion en la universidad de Arkansas, y encontre los nombres de dos de las pinturas de este articulo. La numero 2 se llama JUSTICIA y la numero 3 se llama ESQUIZOFRENIA EN LA CARCEL. gifted artist and a wonderfully astute person. Does anyone know the name of the first painting? I recently visited Medellin and saw one work “Contrastes” and was hooked and an instant fan I did see other works at Museo do Antioquia and was equally impressed. My daughter and I went to El Museo de Arte Moderno where she has a sala named after her and the walkway leading up to the Museo is lined with lots of her promenent works. She certainly was a feminist and ahead of her time. I am trying to locate some of her stuff here in San Diego, California.